One day, a kind woman decided to put a classified ad on Facebook to give away three kittens who were all in need of a loving home. The woman almost immediately received a response from a man, but his intentions were anything but kind. It turned out that the man who contacted her was planning on using the three kittens as ‘bait cats’ for illegal dogfighting rings. Luckily, she found out just in time and decided to take the Facebook post offline. 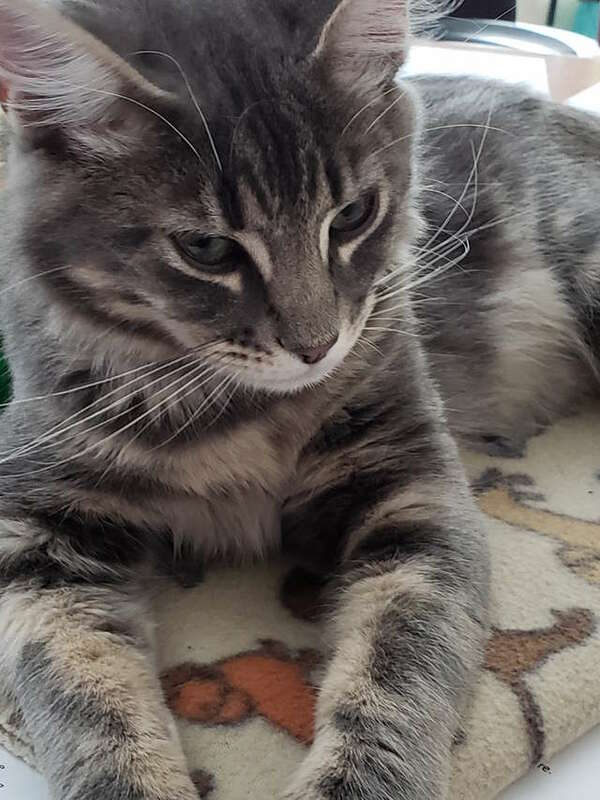 These three kittens still needed a home, though, but then Officer Andy Simmons heard about the whole situation and incident online because his wife told him about it. Officer Simmons and his colleagues from Hillsborough PD in North Carolina have a history with pets. 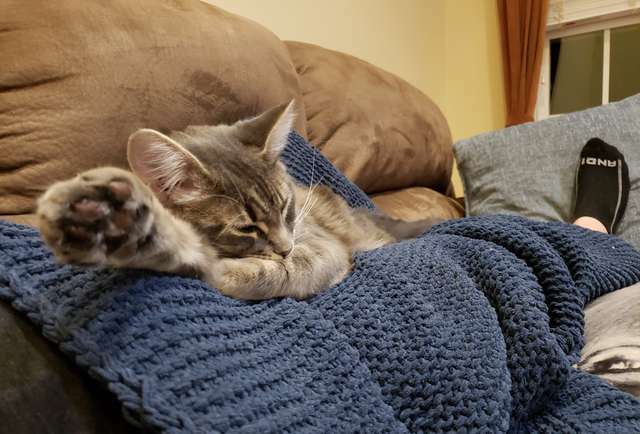 The man rescued a severely-injured kitten from a vehicle just a couple of months earlier, and he bonded so much with the poor feline that he made the decision to adopt him. 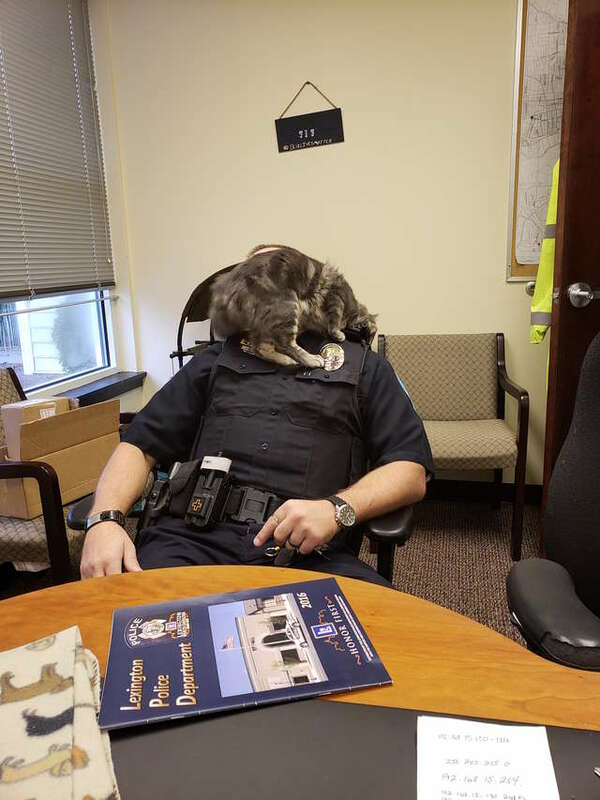 The police department gave him the title of Officer Monty Sprinkles, but his health was still in a critical condition. Tragically, the cat passed away due to his sustained injuries. Officer Monty will never be forgotten and there’s been an empty feeling in the police department’s office ever since he passed away. When Officer Simmons heard about these three kittens, he and his colleagues decided to help out. 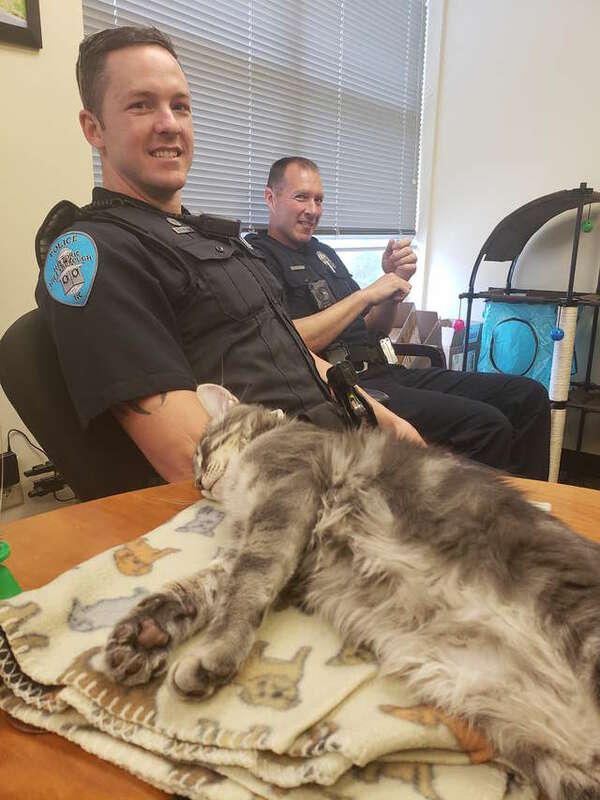 Two fellow officers adopted a cat each and have given them a warm home, and Officer Simmons decided to adopt the third one for himself. 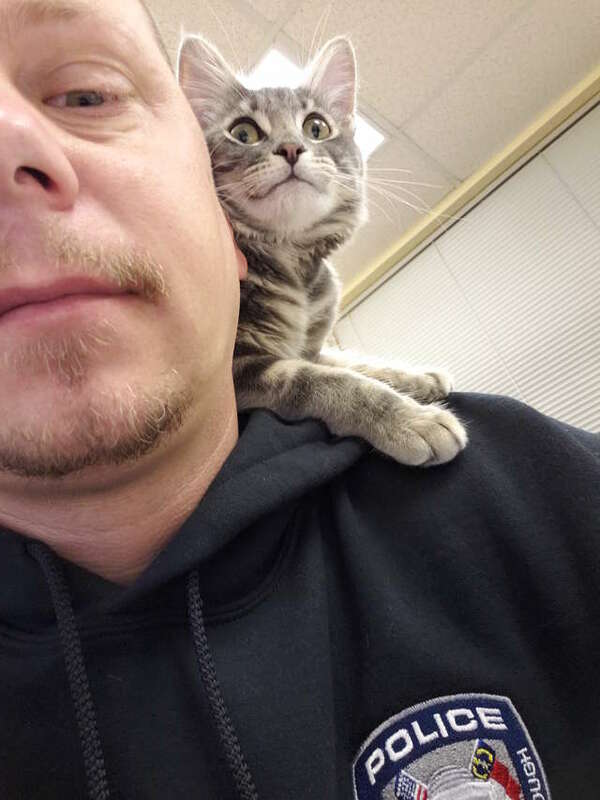 He named her Mercy and it didn’t take long before she would become a regular visitor to the police department. Mercy and her new owner bonded immediately and are the best of friends. 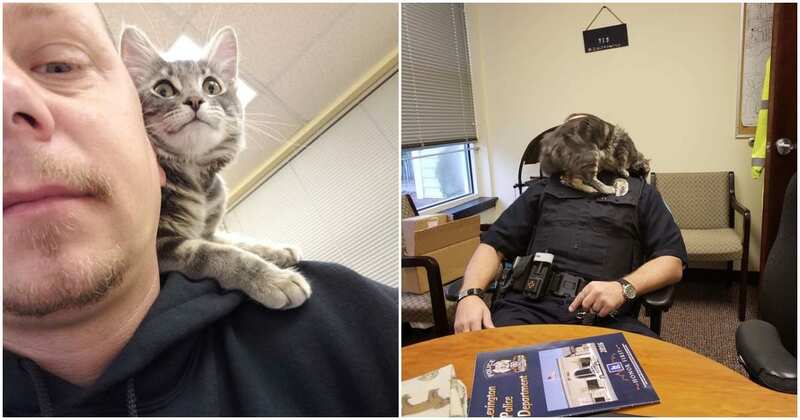 You can just see that these two love spending time together, and the adorable feline follows the brave police officer around everywhere he goes. Even funnier is that she seems to have learned a thing or two from her dad, as her curiosity would make her a good detective. After a while, Mercy was also given the title of ‘Officer’ by the man and his fellow officers. 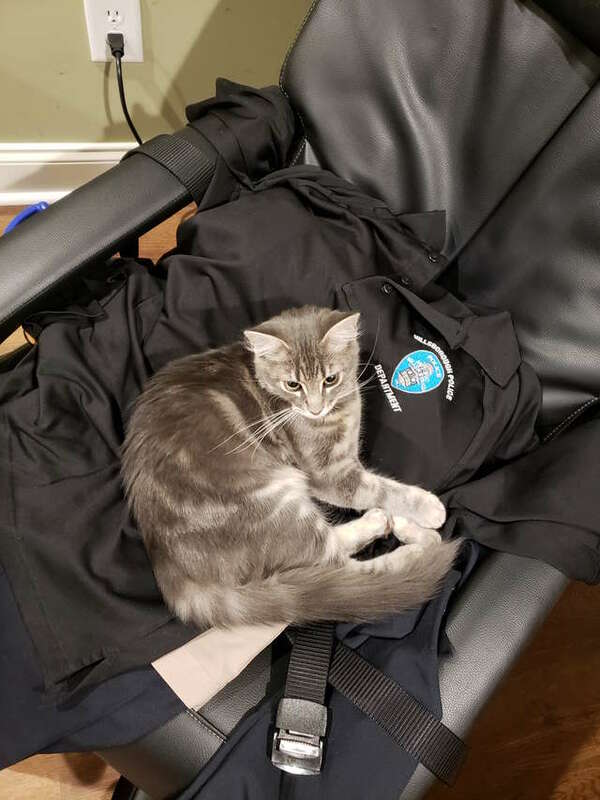 Some of Officer Simmons’ colleagues were a bit skeptical and weren’t too keen on having Mercy around in the office, but she quickly won the hearts of everyone with her amazingly affectionate personality. 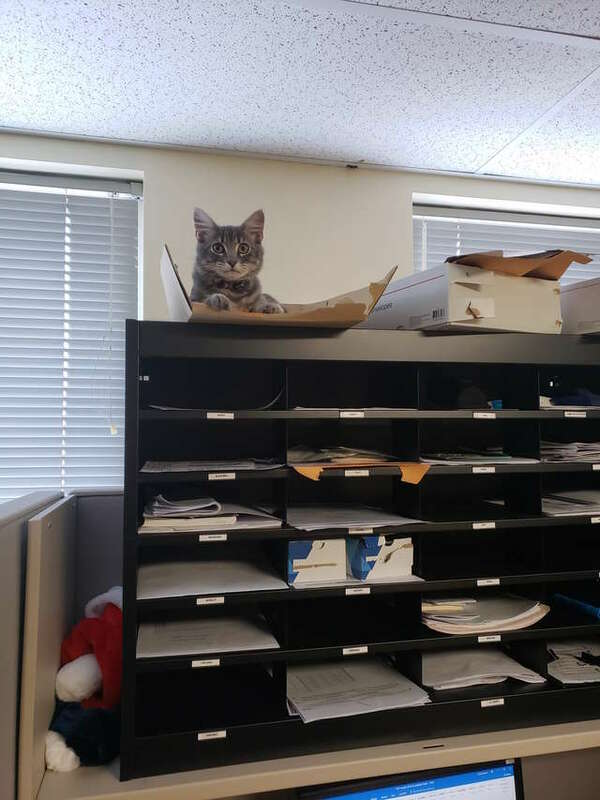 Mercy even has her own dedicated spot in the office to play in while dad is working on a case. He installed a complete and compact jungle gym where Mercy feels totally at home. Whenever any of the other cats or pets visit, the four-footers come together for a fun and joyful play session. 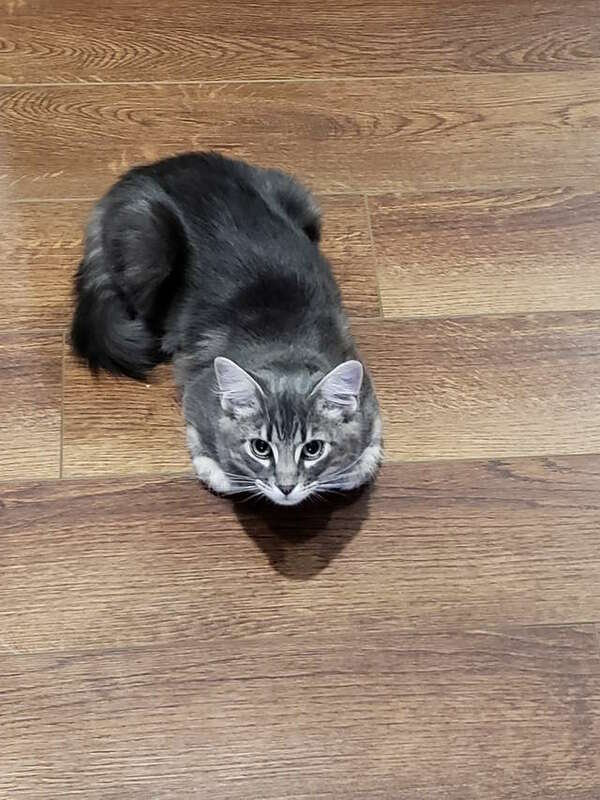 If you can’t find her in the jungle gym, you’ll probably spot her somewhere around the office. She just loves to explore the whole place and to greet her fellow officers. Everyone adores having Officer Mercy around because her personality and smile is just undeniable. Officer Mercy the police cat is now leading an exciting life with a warm place to call home, loving owners and fantastic colleagues. It’s a sharp contrast with the criminal’s plans to use her as bait for an illegal dogfighting ring, but luckily, these police officers stepped in to give Mercy the life that she deserves. One thing is for sure: Officer Mercy and Officer Simmons are true partners for life!